ATtiny84 that can be programmed with Arduino IDE, add wireless transmission, less than 5 µA during sleep - you can build wireless mesh of ie.temperature sensors with central unit that will collect all values. 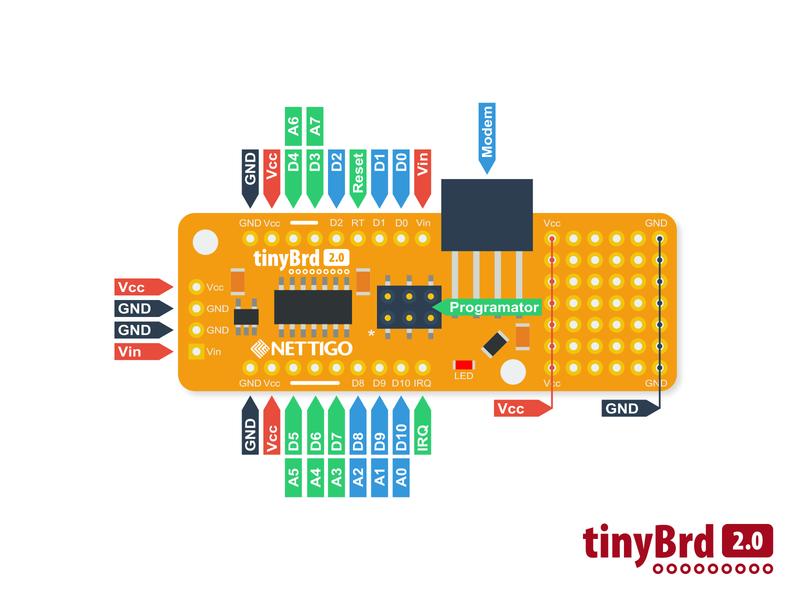 We are adding free proto board to each tinyBrd 2.0. Now You have even more place to build Your devices. We introduce you a tinyBrd 2.0 - successor of tinyBrd 1.2. New version is smaller, however it has significantly larger prototype field. New additions are on board voltage regulator which supports up to 16V and red LED. tinyBrd - what is it? 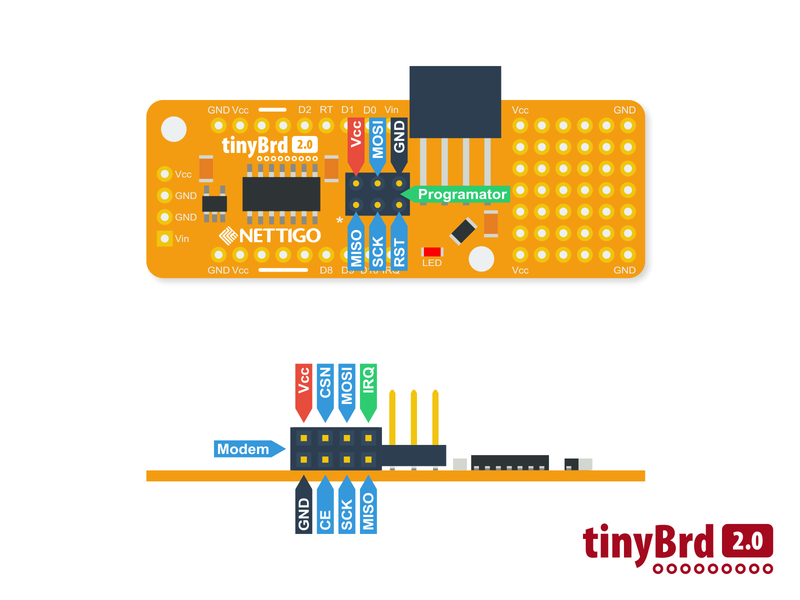 tinyBrd is a development board for testing and building wireless sensors. It's very small, it has ATtiny84, connector for nrf24L01+ radio and prototype field. You may ask what about software? We've prepared for you a package with everything that you need to program this board through Arduino IDE (boards module and libraries). The software is in constant development, each release brings new functionality and additional libraries. Wireless communication You only need to write the address of the main unit (receiver), then you define data structure and everything is ready to be send. Sleep mode By calling one function you're sleeping down the ATtiny and nrf24L01+ for previously defined time. During sleep mode tinyBrd is consuming lest than 5 µA! During transmission power consumption increases up to 15 mA. Actually you may achieve even less than 1 µA by using tinyBrd in deep sleep mode utilizing pin change interrupts. Depending on configuration - it means months on single CR2032 battery cell. Battery monitor Because we'll be mostly using tinyBrd as a standalone sensor, we decided to add function that checks battery level and send a report to main unit. For programming we suggest USBasp or Arduino UNO as a programmer. In version 2.0 we changed programming socket. You may need ISP 10 to 6 pin adapter. Please be aware, that tinyBrd 2.0 comes without goldpins. You will need them if you are planning to use tinyBrd on breadboard. If soldering is a bit too hard for you or you don't like to solder, we may solder it for you. Version 2.0 is quite different than previous 1.2. This is definitely change for good. Previously it was common mistake to connect 5V to tinyBrd with NRF24L01+ - resulting in damaging of NRF radio. That's why we decided to put voltage regulator (LDO) on board. Now you may supply tinyBrd with voltage up to 16V. Also it's now safe to power the board from 5V programmer with connected NRF modem. tinyBrd 2.0 has two voltage inputs: Vin - connected to LDO (up to 16V) nad Vcc - which bypass LDO (up to 3.6V). After cutting the trace between Vcc and LDO you can no longer supply the board with voltage above 3.6V, but it will be more energy efficient - exact the same as tinyBrd 1.2. This product contain assembled and ready for work tinyBrd 2.0 board and NRF24L01+ modem. You may also pick NRF24L01+ PA+LNA as option instead of regular NRF. Please notice, that you will need one more additional NRD24L01+ modem and receiver (eg. Raspberry Pi, Arduino UNO or another tinyBrd board). This board works also with NRF24L01+ PA+LNA, offers better range, however current consumption will be higher. If you are looking for easy way of connecting NRF24L01+ to Raspberry Pi please look at our NRF HAT. No additional cables are required. Quick start: Add to Board Manager new board using this URL: http://static.nettigo.pl/tinybrd/package_nettigo.pl_index.json Install tinyBrd Core using Board Manager. Arduino IDE is ready to work with tinyBrd. On board are brought all ATtiny IO ports, however D3,D4,D5,D6 and D7 are used by NRF. You can not use it as generic IO when NRF is in use. Eagle files with tinyBrd 2.0 board project are ready to download at the bottom of page.